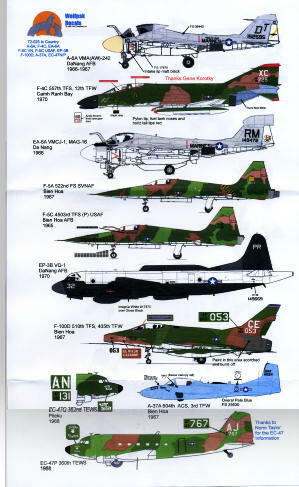 This latest sheet from Wolfpak Decals has more Vietnam era subjects. Specifically, these were planes that operated out of South Vietnam. 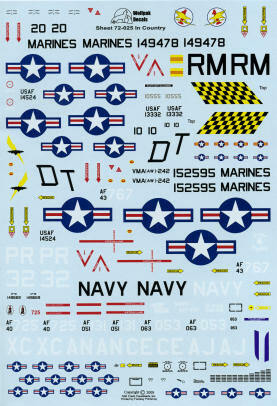 All of them fall into the 1966 to 1970 time frame and include many types, a trait I appreciate from Wolfpak Decals. The instruction sheet for this set is the best in the business when it comes to background information and what may be needed to accurately depict the aircraft being modeled. In addition to the actual placement profiles, there are several additional pages of information that include a history of the type, kits and update bits for these schemes, as well as load-out information, and any changes needed to properly model the aircraft in question, assuring you of the most accurate model you can have. At the top of the page is an early A-6A from VMA-242. This one is in the usual light gull grey over white. At this time the upper grey was a matte or near matte appearance. Can't have a Vietnam sheet without a Phantom, so we have an F-4C from 557 TFS, 12th TFW. The trim on this one is in red. A nice EA-6A for those frustrated with the Fujimi kit decals. This VMCJ-1 plane is one moded from early A-6s so has the perforated dive brakes. The first of two F-5s is this F-5A from the 522 FS of the SVNAF. The other is a USAF F-5C from the 4503 TFS Provisional) with a very healthy mission tally on the nose. Next, an EP-3B from VQ-1 in the original paint scheme. By the time I got to the squadron in the early 1970s, they had not only moved to Guam, but their Orions were painted in standard white over gloss light gull grey, just like their EC-121Ms. The B models carried the old 'Bat Rack' ELINT systems but were quickly switched to the 'Aries I' system, making them EP-3Es in terms of electronics. These planes used the ancient tube technology APS-20 'Big Look' radar system in the lower fuselage bulge. This old system was initially used on TBM-3W and P2Vs, but was quite effective thanks to the range of the system so held on for many decades. The instructions state that its eventual fate is unknown, but records show that PR-32 served for many, many years (flying its 20,000th flight hour in 1986) and was scrapped at LMALC Greenville when the airframe time ran out along with other initial batch of EP-3s. Next is an F-100D from the 510 TFS/405 TFW. This plane is rather plain as Huns go, though the tip of the fin is purple. A most interesting A-37A in overall pale blue from the 604th ACS in 1967. Finally, a pair of EC-47s. The nose section is an EC-47Q with the 362 TEWS while the full version is an EC-47P with the 360 TEWS. The instructions will tell you of the differences in the types. One often wonders about just how many C-47s of all versions were used in Vietnam. I'll bet a staggering number. The kit you want for this is the old ESCI 'Que Serra Serra' boxing as it has the extended radar nose that is needed. I'm not sure if Italeri has ever re-issued it but it is worth seeking.